How Do You Know It’s Authentic? Home / Pottery / How Do You Know It’s Authentic? Native American Indian pottery is unique to North America, and pottery from the Pueblo traditions is unique to the Southwest. Its rarity already lends Native American Indian pottery inherent value. Recognizing that each Pueblo’s technique and style have been developed over centuries, mastered by individual artists over years and is reflected in each one-of-a-kind piece, though, inspires a deeper awe. But some of the magic is lost when a piece is a fake. To truly experience the magic of Southwest art, it needs to be authentic, and there are some ways that even those new to Native American Indian art can determine authenticity of a piece. When considering purchasing Native American Indian pottery, potential buyers can get some peace of mind from federal restrictions on the way art is marketed. To comply with the Indian Arts and Crafts Act of 1990, terms like “Native American” and “Indian” can only be used to label a product made (after 1935) by a member of a state- or federally-recognized tribe or nation. However, buyers must beware of similar-sounding terms that get around the federal labeling restrictions. Where “Indian” may only be used to label a product created by a Native American Indian artist, the term “Indian-style” can be used for products that mimic the style of Native American Indian art but are created by non-Native American Indian artists and/or mass-produced (possibly outside the U.S.). Although some Native American Indian artists do delve into ceramic pottery (greenware), those who stick to their Pueblo’s pottery-making traditions will hand coil clay to create vessels. While the artists spent countless hours forming, smoothing and decorating a piece to have a flawless appearance, signs that the piece was created by human hands are unavoidable. So, authentic hand-made pottery will more often than not have finger markings on the inside of the vessel. Because each piece is a unique expression of the artist’s imagination, cultural heritage and skill, they proudly sign their work, each with a distinctive signature or hallmark. Most artists sign their work by etching their names, sometimes their Pueblo affiliation, into the bottom of the piece; some paint their signature on the piece after firing. If the piece lacks a signature of any kind or is clearly stamped, the piece may not be authentic. To determine the reputation of a trading post or dealer, do some research. Check out their website—how long have they been established? How involved are they in the Native American Indian art community? If you are able to visit the store, ask questions to get a feel for their level of expertise. They should be able to tell you about where each piece came from, share information about the Pueblo’s style and tradition and about the individual artist. Each piece of authentic Native American Indian pottery is one-of-a-kind, the result of an artist’s individual expression of craftsmanship passed from generation to generation. The price should fairly reflect the painstaking labor and cultural significance represented by the finished piece. If you feel you’re getting “a steal” on a piece of Native American Indian pottery, the reason may be that you’re getting a fake. While price will vary significantly based on the size of the vessel, the intricacy of the work, the artist’s reputation, whether or not the artist is living or deceased, etc., authentic Native American Indian pottery does not come cheap. However, purchasing an authentic piece is an investment. When well-cared for, the beauty of the piece will last a lifetime, and its value will continue to appreciate over the years. It’s true that to achieve a Southwest décor, you don’t have to have authentic Native American Indian pottery. But if you settle for a fake, you don’t realize the benefits of owning genuine handmade Native American Indian art. More importantly, when you invest in authentic Native American Indian pottery, you support Pueblo artists, many of whom support their families with the income generated by their art. In addition to economically sustaining Pueblo artisans, your investment in authentic Native American Indian pottery also helps preserve and celebrate traditions and ways of life of the Pueblo peoples. If you are ready to experience the magic of authentic Southwest art, visit Palms Trading Company. 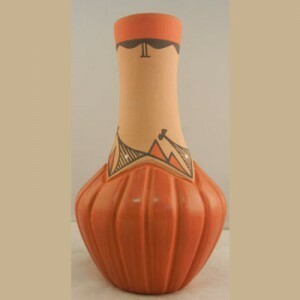 We can help you find the perfect piece to start or grow your collection of Native American Indian pottery.